Jennifer Sanmann, Ph.D., has always been interested in helping children, from her early graduate work in speech impairments and language development to her current research on pilocytic astrocytomas, a subset of brain tumors in the pediatric population. Now, with the help of the UNMC Department of Pediatrics Gladys Pearson Grant, she will be able to explore the creation of a diagnostic tool that will enhance treatment of these tumors, as well as ease uncertainty in the minds of these young patients, their family members and their parents. 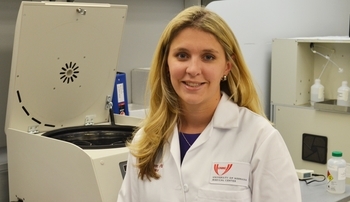 Dr. Sanmann, an assistant professor at the Munroe-Meyer Institute and associate director of the Human Genetics Laboratory, will use the funding from the grant, which is offered to members of the UNMC faculty working on pediatric cancer and genetic research, to help differentiate pilocytic astrocytomas from other pediatric brain tumors. "Pilocytic astrocytomas typically have a favorable prognosis," Dr. Sanmann said. "Surgeons can remove the tumor with a low likelihood of local recurrence, and kids typically do very well." Unfortunately, it can be difficult to histopathologically differentiate these less aggressive tumors from other, more aggressive malignancies. "Our goal is to see if there's a molecular signature that would help us to differentiate these pilocytic astrocytomas from other tumors that would require more aggressive adjuvant therapy," she said. "We hope genetics can help to design therapy, both by ensuring aggressive treatment when warranted but also by minimizing aggressive therapy when possible for lower grade tumors such as pilocytic astrocytoma." Presently, the tumors are sent to a pathologist for examination and staging based on a variety of visual markers, including architecture and cell structure. Dr. Sanmann's goal is to establish a genetic profile to more definitely diagnose pilocytic astrocytoma that will work in concert with the traditional histopathological assessment. "The project developed out of a conversation with the oncologists and pathologists at UNMC and Children's Hospital about their clinical needs and diagnostic challenges and how genetics may help meet those needs." Dr. Sanmann is planning a two-year study that will compare the genetic signatures of 20 pediatric pilocytic astrocytomas to those of 20 other pediatric brain tumor samples of similar cell origin. She is in the process of finalizing the project with the Institutional Review Board and hopes to begin upon IRB approval. The Gladys Pearson Grant was created in 1989 by Paul Pearson, M.D., to honor his late wife. Dr. Pearson, who served as the first director of the Munroe-Meyer Institute from 1968 to 1982, intended the grant to provide support for training and research in the areas of pediatric cancer and genetics.